The annual Gravenstein Apple Fair takes place this weekend, August 11 and 12, at Ragle Ranch Park in Sebastopol. Celebrating its 45th year, the apple fest hosted by Sonoma County Farm Trails is well-known for old-fashioned fun that includes everything from farm animals, and arts and crafts booths, to apple pie baking and eating contests. But the annual bash is gaining fans for its varied selection of artisan adult beverages. This year, fair-goers can choose from more than 35 Sonoma County wines, 17 ciders and 6 microbrews, all in one oak-shaded park. In other words, it’s hard to go wrong, no matter what you decide to fill your glass with. Big-name wineries are increasingly canning their wines, joining craft ciders and beers on retailer shelves. Beer in cans? Of course. Wine in cans is a somewhat newer phenomenon. But before you dismiss it all as plonk — which, until recently might have been justified — look at what Francis Ford Coppola put in distinctive narrow cans with his Diamond Collection, more serious than most. His nicely structured new Monterey County red is a food-friendly pinot noir. In recent years, canned wine has become ubiquitous. The convenience of a can, coupled with clever packaging and more approachable messaging, has helped marketers grow millennials’ interest in drinking wine. For the Coppola Winery, the trick isn’t to suddenly start making canned wine—the winery has been doing so since the early 2000s—but to educate consumers about its canned wine offerings. The family winery will have a strong presence at the Sundance Film Festival this year with a lounge space, dubbed the Coppola Club, and the announcement of winners for its short film competition. Francis Ford Coppola Winery has renewed a pair of high-profile partnerships. Pours will continue courtesy of new pacts with the Sundance Institute and the Academy of Motion Picture Arts and Sciences that will see the winery return for a second year in a row as exclusive wine sponsor of the Sundance Film Festival in Park City, and the brand will be the sole wine poured at the 90th Oscars and Governors Ball, the official post-Oscars celebration. Scheduled for March 4, the event will feature custom wine blends and commemorative labels for this year's special anniversary. Francis Ford Coppola hasn’t directed a movie since 2015 (something called Distant Vision) or a good movie since 1992 (Bram Stoker’s Dracula, don’t @ me), but the Hollywood icon has kept plenty busy as a wine maestro in his semi-retirement. The 78-year-old first entered the wine business in 1975, pre-Apocalypse Now, when he and his family purchased the Gustave Niebaum vineyard in Napa County. Since then, he has snatched up other California wineries (Inglenook, Virginia Dare) and built a home base in Sonoma (Francis Ford Coppola Winery), cranking out solid vinos (such as the Bordeaux-like Archimedes and the Eleanor Red Blend) while his kids and nephews (like Sofia Coppola, Jason Schwartzman and Nicolas Cage) carry on the family name, sort of, in Tinseltown. Great Women Spirits — small-batch, house-crafted, classically styled spirits — will officially launch on Ada Lovelace Day (an international celebration day of the achievements of women in science, technology, engineering and math), Oct. 10, at Cafe Zoetrope in San Francisco. Great Women Spirits launches with three spirits: American brandy Maria Gaetana Agnesi 1799 Aged 5 Years Old, Countess Walewska Premium Vodka, and Ada Lovelace Gin. The range is inspired by “unique and remarkable” women including Italian mathematician Maria Gaetana Agnesi, Countess Maria Walewska and computer programmer Ada Lovelace. Each spirit is made with spring water from Coppola’s Inglenook property in Napa Valley. The water is naturally filtered through lava rock at the base of an inactive volcano. The famous Coppola family—of whom the filmmaker Francis Ford Coppola is the patriarch—is venturing further into the beverage industry with a line of liquors called “Great Women Spirits.” They already own a winery, aptly named Francis Ford Coppola Winery, through their lifestyle company The Family Coppola: Cinema, Wine, Food, Hideaways, and Adventure. Having successfully secured a craft spirits license, The Family Coppola is proud to announce the launch of Great Women Spirits, which will be available this October in select restaurants and retailers. Great Women Spirits -- small-batch, house-crafted, classically styled spirits -- will begin production with its brand of vodka, gin, and brandy, and has plans to expand the collection in the near future. It makes sense that ‘The Godfather’ of film would blend all of his interests in one, which is exactly what Francis Ford Coppola is doing: it was just announced that his Francis Ford Coppola Winery will be the sole still wine brand poured at the Academy Awards and Governors Ball—the Academy’s official post-Oscars celebration—for the next three years. Additionally, the winery is the exclusive wine sponsor of the 2017 Sundance Film Festival. The Academy of Motion Picture Arts and Sciences has a new wine partner for the next three years. Francis Ford Coppola Winery has announced that it will be the wine sponsor for the Academy Awards and the post-Oscars Governors Ball for the next three years. The wine label also has partnered with Sundance Institute to be the wine sponsor of the 2017 Sundance Film Festival, set to run Thursday-Jan. 29. As part of the Sundance sponsorship, Francis Ford Coppola Winery will host premiere parties during the Park City, Utah-based festival. Select activations include "Drink in the Moment" and "The Big Picture." "Drink in the Moment" is described as a whimsical visual experience via a projected fast-action animated motion short, playing during key moments at Miner’s Park Plaza, while "The Big Picture" will commission a popular artist to create a custom, oversized wine cork mural that will build through the 10-day event in the festival co-op. Recently, Wine Enthusiast featured a boxed wine on its cover as the highest ranked red on our 2016 Best Buys list. Why not explore another alternative: wine in a can? Canned wines and spritzers have become more prevalent over the years and general quality has risen in kind, so we sat down to taste an assortment. There’s no methodology here, just Senior Digital Editor Jameson Fink, Tasting Coordinator Carrie Dykes and Senior Associate Editor Layla Schlack tasting and talking about our favorites of the bunch. The overall verdict? Yes, we can. Once sneered at as too sweet, heavy and unsophisticated, the rise of rosé is now a decade old and still surging: According to Nielsen tracking data, sales of rosé in America between 2015 and 2016 rose more than 17%, while the dollar figure surged even higher — to nearly 42% — reflecting the “premium-ization” of rosé in the USA. In other words, Americans are drinking more rosé and drinking more of premium high-end rosé. I couldn’t help thinking of the Stroop effect when I started popping open cans of wine and drinking them straight from their containers. Remember the Stroop effect? That’s when your brain has to pause to process conflicting information before it can identify what it’s trying to identify. The classic Stroop test has a facilitator timing how long it takes a person to say the names of colors when they’re printed in either their own colors (the word “red” printed in red ink) or neutral black. Response times slow dramatically when the person is shown the names of colors printed in conflicting colors (the word “red” printed in blue ink) and asked to identify the color of the ink. I know, mind-twisting. One explanation is that we identify words automatically due to a lifetime of reading and when we have to switch something in our brains to ID the mismatched colors, it slows us down. I’m paraphrasing a single hypothesis connected to years of serious psychological research, but still, I think something along those lines was happening when I started swigging wine straight from cans — and how else would anyone drink canned wine except straight from the can? We've got four easy-drinking, easy-on-the-wallet wines for your Labor Day sipping pleasure. Here’s how to never see wine the same way again. Ready? Then, when you’re ready, bring the glass back, cover the opening with your hand, and swirl. (This concentrates the aroma.) Lift the glass to your nose right before you take your hand away, and notice the less and more intense smells that waft your way. Just in time for that end-of-summer road trip: Online restaurant reservation site OpenTable came up with a list of the100 most scenic places to dine in the U.S. The selections are based on millions of reader reviews posted on the website. California came out on top with 24 inspiring places to dine, from Duke’s Malibu restaurant and bar overlooking the Pacific to the hilltop Restaurant at the Getty Center. The list includes restaurants in 34 states including Washington state (10) and Florida (7). Healdsburg, a small town with big-city acumen, is a charming respite in northern Sonoma County, with great food, superb wine, memorable vintage architecture and boutiques, and lovely hotels. Drive up from the city and spend a long weekend to refresh and reset. Here’s a selection of more than 30 list-worthy restaurants with shaded patios, prime sidewalk people-watching and sun-dappled gardens worth seeking out. Just remember the sunscreen. The hipster in the YouTube video swirls his glass of wine with a passion matched only by the aggression of the smarmy scowl on his face. Dressed in a denim jacket layered on top of a red hooded sweatshirt and a blue tank top that shows off just the right amount of chest hair, he is the opposite of the old-fashioned wine drinker. And he’s the perfect embodiment of the point that Union Wine Co., an Oregon producer that has made a name for itself by packaging some of its wines in beer-style cans, is trying to make. Honor thy mother! With the celebration of Mother’s Day coming up fast, we’ve been compiling a bevy of thoughtful gifts. Below, a few ideas for every mom, whether she’s artsy, traditional, health-minded to eco-chic or a culinary loving woman. I always think of horseshoes around Thanksgiving. I haven't pitched a shoe in years, and it's not that the approaching autumn feast makes me want to find some nice clay pits and zero in on a stake. It's just that I have to choose the wines for the most ridiculous and glorious dinner of the year. In horseshoes you listen for that subtle tink of shoe against stake, or the clang and jangle of a more ostentatious ringer. That's the goal — a ringer — but as long as you come close to the target, you still get points, and points here and there can add up to an overall win. This is how you want to think about matching wines with Thanksgiving dinner. Want to get your wine-loving friends something great this holiday season, but don't want to spend lots of money on a nice bottle of wine? Fear not, because there are plenty of other things you can get for your wine-o pals that they'll be just as excited about -- wine-drinking accessories like funky decanters, cute corkscrews, or even kits for them to make their own wine! I am walking through a winery -- blindfolded. But you can banish any thoughts of "50 Shades of Grey." This is a Tasting in the Dark event at Francis Ford Coppola Winery in Geyserville, and it's about to get very dark indeed. We're greeted with a glass of bubbly upon arrival -- presumably to calm any fears about our impending loss of sight. "Once I give you the blindfolds, you may feel a little vulnerable," one guide tells us. If you're heading to California wine country for your bachelorette party, check out our recommendations for the best places to wine, dine, and relax in Napa Valley and Sonoma County! If you’ve been to one winery, you’ve been to them all, right? There are acres of grapes, clinking glasses, and enough wine to cater a Real Housewives reunion. But in Sonoma County, nestled in the rolling hills and endless skies, lies one winery whose style is unlike any other. Yahoo Travel Editor Brittany Jones-Cooper goes behind the scenes at the Francis Ford Coppola Winery in Sonoma County. Resplendent in its skinny pink can, Sofia Mini is not a new product, but the bar around the corner from my Brooklyn apartment just started selling it, and I’ve been noticing it lately in quite a few area watering holes. It’s not good! The first time I tried Sofia Mini, it neither exceeded nor fell short of my expectations. Sometimes in life, you may have a vendetta. No, not that feud – more like the Francis Ford Coppola kind of wine. Vendetta’s bold flavor comes from the combination of cabernet sauvignon from Mendocino County and Malbec from Monterey County. The cabernet flavors were chosen for its textural dimension, moderate tannins and floral nuances that go well with the Malbec, which boasts a cherry cola aroma. We love the peppery mineral qualities that are found in the flavor along with toasted wood. In celebration of the 2015 harvest, which just kicked off in Sonoma County, find out what the winemakers at Francis Ford Coppola Winery do to unwind during the busiest time of the year. From jogging around the vineyards to jumping into the winery's pool, these winemakers make the most of harvest. Gia Coppola has been keeping busy since directing pal James Franco in 2013’s “Palo Alto.” The 28-year-old granddaughter of Francis Ford Coppola spent the summer curating an Italian cinema series with Peroni, modeled in a Rodarte campaign earlier this year, and is revamping her own line of wine, aptly named Gia. Enjoying wine in a park or at the beach no longer means pouring a bottle into a Thermos or hiding in shame behind your cheap box of Franzia wine. There are now several high-quality options in sleek, easy-to-grab containers that will make you feel like the coolest person at the picnic. Putting wine in a can makes it lightweight, unbreakable, and crushable (nice when backpacking out your empties). None of that matters, of course, if it tastes like, well, what you might expect wine in a can to taste like. We know what you’re thinking, but hear us out. Many wineries offer onsite delis or restaurants and picnic spots (with gorgeous scenery), perfect for a family outing. Others offer grape juice and activities for kids to enjoy while you (responsibly) decide whether or not the Pinot Noir trumps the Cabernet Sauvignon. Cheers! The Fourth of July is here and we are feeling patriotic. It’s America’s birthday, after all, and we know that celebrations are more fun when you pop open a few bottles. Whether you are grilling up some hot dogs, hitting the beach or taking in a spectacular fireworks display, these budget-friendly, all-American sparklers are your go-to bottles this Fourth. Below, our tasting panel weighed in on their favorite pours, with hand-selected pairings for each bottle. Cheers! Rustic, Francis’s Favorites – Geyserville, Calif.
You'll probably want to go on a weekend jaunt at the Coppola winery and hang out in and around one of these two pools. Probably. Lori Bisordi grew up watching her nonno farm their ranch in the Russian River Valley, where they now primarily grow Zinfandel and Chardonnay grapes for wineries such as Martin Ray and Kunde Family Estate. For the Bisordis it is a beautiful way of life, yet a fragile one. The 20-year-old and third-generation farmer knows that agriculture these days is often seen by others in a “dim light” — leeches on the environment, especially at a time when water in California is scarce. That’s why when the Sonoma County Winegrape Commission announced that it wanted every vineyard and winery in the region to be certified sustainable by 2019, she persuaded her family to get involved with the program. For Hoby Wedler, the ocean is not about the view. It’s the smell. “It’s oysters and fresh fish and seaweed,” explained Wedler, a blind man who sees life — and wine — through colorful aromas. Since 2011 he has been using that unique gift to lead “Tasting in the Dark” wine tastings at Francis Ford Coppola Winery. In addition to sampling the wine, it’s a chance for guests to meet a blind man with vision. Petaluma native Hoby Wedler, born with a rare eye disorder causing blindness, breaks into the wine industry using his keen sense of smell. The Godfather - like another Mob-centric piece of culture, The Sopranos - has moved well beyond the space a movie, even a very good one, occupies in our culture to become a byword for perfection. After winning his second, third, and fourth Academy Awards for that film, Coppola went on to direct movies like The Conversation, Apocalypse Now, and The Outsiders, standing alongside Spielberg as one of the premier American film directors of the late 20th century. Sixteen years ago, the filmmaker and vintner Francis Ford Coppola named a personal batch of blanc deblancs sparkling wine after his effervescent daughter Sofia, who loved it so much that they decided to produce it on a larger scale and sell it to the public. The blend, best known as the bubbly packaged in chic little raspberry-colored cans (accompanied by miniature straws), became the first Coppola wine named after Sofia. I can’t think of a better place to get to know someone than a dark, buttered-popcorn–scented movie theater, avoiding each other’s gaze and conversation for hours on end. And if you’re like me (God bless you), you never go to the movies (or to your in-laws’) without a little bottle of something fun and at least 80 proof to keep your various lipsticks company. So cheers to Valentine’s Day with these adorable minibottles that will fit snugly in your bag as you head out to see Fifty Shades of Grey or Paddington or whatever else is coming to a theater near you. Just in time for the popular premiere of Downton Abbey's fifth season, Downton Abbey Wines expands its portfolio with the new Countess of Grantham Collection, inspired by American-born character Lady Cora Crawley. The New World-style collection—a counterpoint to the other Bordeaux-style Downton Abbey wines—features a Chardonnay and Cabernet Sauvignon, both sourced from Lodi, California, and will be sold for $15 a bottle. What do earthquakes, Cuba, the Coppolas and Grumpy Cat all have in common? Unfiltered predicts they'll all play a major role in our wine conversations this year. But before we get to the fun and fortunetelling, let's take a peek back at how we did with last year's predictions. Why did you decide to become a hotelier? Why share your homes with everyone? I always tell my kids, 'You can buy anything you want - an apartment in Paris and a boat and this and that, but you're going to be working like a dog just to achieve the maintenance'. I realised when I had my first place in Belize: other guests would pay a fair price [to stay there], which would enable us, as a family, to keep it, and suddenly we ended up in the hotel business. The filmmaker on the best luggage, life's greatest luxury and how 'Apocalypse Now' made him a hotelier The story of what got Francis Ford Coppola into the hotel business is one of a simple plan that became complicated. It started with the making of his Vietnam War epic, "Apocalypse Now," released 35 years ago next week. Though shooting in the jungles of the Philippines pushed Mr. Coppola to his limits psychologically and financially, he nonetheless grew attached to the setting. "When you work or stay in a location for a long time, as I did, you fall in love with it," said Mr. Coppola, now 75. Traveling through the rugged, under-the-radar Basilicata region of southern Italy still provides the thrill of discovery. Located above the “arch” of Italy’s boot, Basilicata (known locally as Lucania) may not have the glamour of the Amalfi Coast or the polish of Tuscany. But it does have a wild beauty that can seem otherworldly, even biblical: ancient buildings hewed from honey-colored limestone; black-sand beaches fringing a verdant coast; and a simple yet rich culinary tradition. Once a place of exile, this southern Italian region lures visitors with its hearty and rustically glorious food and incredible wine. Brad Johnson reviews his discoveries. Boom! Boom! Gunshots shatter the early morning calm. It’s not yet 8 a.m. when two rifle blasts echo through the countryside. Most of the village of Bernalda is already awake. I’m halfway through a bicycle ride when the gunfire reverberates through the valley that surrounds this sleepy Italian village. Many are unaware that the Godfather don, Francis Ford Coppola, has a hotel line. Jade Conroy takes a lesson in how to holiday la famiglia Coppola way...Then there was, perhaps most importantly, the six-year renovation of the Palazzo Margherita in Bernalda, Italy. It’s been a project close to Coppola’s heart, for Bernalda is the birthplace of his grandfather. In the same vein, the nine suites are named, and were designed, by the members of his family (not to mention consulted once again by Tavoularis). Sofia married there in 2011 before it opened the following year. Among the Director’s Cut releases, Cinema is perhaps the most distinctive... Oh, and the label is very cool – and very cinematic – as well. Hollywood great Francis Ford Coppola has about as much passion for great wine as he does for great film - and he's been in both businesses for nearly as long. A poolside feast with the Coppolas...I enjoyed a lazy lunch with a fresh-baked pizza, an overstuffed muffaletta (the classic New Orleans version of an Italian hero) and, of course, wine. Headed to the New York City Wine & Food Festival or any other major culinary event soon? If so, you'll want to watch our survival guide to braving a weekend's worth of food, wine, and spirits. At the Food & Wine Classic in Aspen, we asked everyone from pastry whiz Jacques Torres to Iron Chef Michael Symon to former Top Chef contestants what their insider tips are for navigating an epicurean event. Learn what their best practices are — plus our secret tip for navigating tasting tables! With Halloween approaching, Mark visits Hollywood's magnificently haunted Chateau Marmont to reveal a perfect wine for share with ghosts of Chateau's suite 69. Opining on wine enclosed in a can, he reminds us that anything that lessens the distance between your mouth and the wine is a good thing. Matchbox Twenty's front man, Rob Thomas, says the band's new album, "North," was fueled by red wine, namely Francis Ford Coppola Winery Director's Cut Pinot Noir. Kris Schoels of youngmarriedchic.com has the must have travel items for every carry on bag. Ray Isle, executive wine editor of Food & Wine, selects fantastic bottles from six of the countries competing in the Olympics -- and they're all $20 or less. So raise a glass (or two... or three)! It’s no secret that you can’t exactly have a pool day in San Francisco. You know, pool days, those days by the pool with a cold, adult beverage in hand, so hot that you can’t help but jump in the pool every so often to stay comfortable. Yeah, you can’t do that in San Francisco. However, that summer pool day you may be longing for isn’t too far away–it's just across Highway 101 in Sonoma County at Francis Ford Coppola Winery. That’s right, vino and pool time. This hotel in a restored late-19th-century villa has an unlikely location—the workaday hilltop village of Bernalda, in the arch of Italy's boot. But Bernalda is also the hometown of director Francis Ford Coppola, who thought it the perfect site for his most recent luxury inn, which opened this spring. While celebrity pedigree may be part of the draw, the nine-room hotel can easily stand on its own in terms of appeal. The crème de la crème of wine-themed watering spots? All tracks lead to the posh pool of Francis Ford Coppola Winery. Seriously, this swimming sanctuary is giant and has a Euro-fab feel. Reserve a cabine ahead of time to be assured luxe pool chairs. 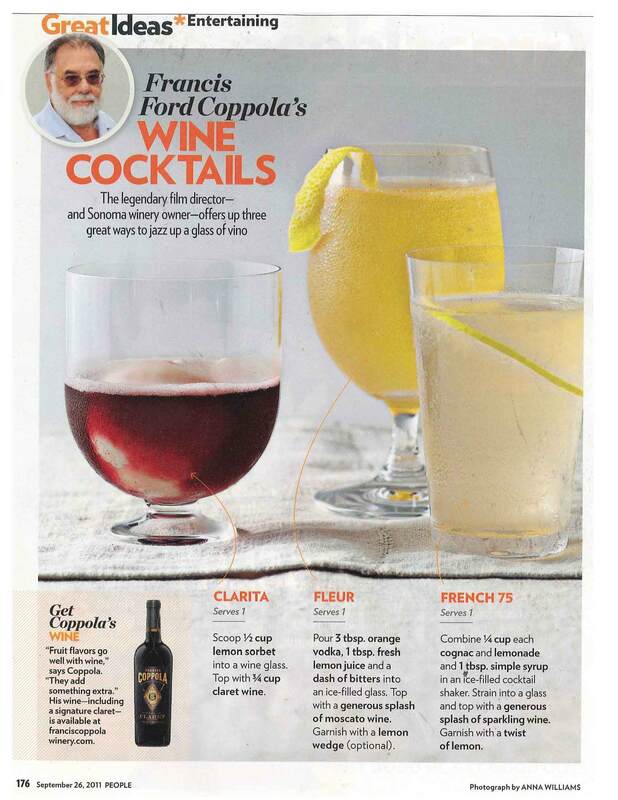 Francis Ford Coppola takes his wine and food seriously, believing that the two should really be enjoyed together. Notes Corey Beck, wine director for Coppola Wines, “One of Coppola’s philosophies, and something he always stresses, is the enjoyment of wine and food together. Palazzo Margherita, Francis Ford Coppola’s fifth property, is set in the Basilicata region in the small town of Bernalda, where his grandfather lived. The Medieval hilltop city overlooks the Ionian Sea, has no major attractions and doesn’t see many tourists—and that’s its charm. A remodeled 120-year-old palazzo is now an intimate nine-room resort, the Palazzo Margherita, which opened March 1 in the Southern Italian town of Bernalda. The hotel is decorated with hand-painted fresco ceilings and marble floors dating to the 1800s and restored to their original luster, while furniture pieces by French designer Jacques Grange offer bits of Moroccan and Baroque flair. Besides being a filmmaker and a winemaker, Francis Ford Coppola has owned hotels and resorts since the 1980s. With his latest, Palazzo Margherita, palazzomargherita.com, in Bernalda, Italy, he now owns five properties. His first, the Blancaneaux Lodge in Belize, was a result of his developing an affinity for the jungle, “as people do,” he said, while filming “Apocalypse Now” in the Philippines 35 years ago. The latest, in the Basilicata region of Italy near the boot’s arch, was inspired by family. One of Hollywood's most respected directors has opened a hotel in a palazzo in southern Italy. Francis Ford Coppola, the head of a dynasty of film-makers and most famous for directing The Godfather, is expanding his portfolio of luxury properties with a 19th-century Italian villa, his first hotel in Europe. Opening today, Palazzo Margherita is located in the attractive little town of Bernalda - the birthplace of Coppola's grandfather, Agostino - in Basilicata. Poised to put Southern Italy’s little-known region of Basilicata on the map for fashionable travelers, film director-hotelier Francis Ford Coppola has just debuted his glamorous new Palazzo Margherita in the tiny hill town of Bernalda, his ancestral home. The Palazzo, originally built in 1892 and totally restored and redecorated by Coppola, working with star French decorator Jacques Grange, has nine lavish rooms and vast suites, most with terraces and balconies, enormous bathrooms, beautiful tiled floors, and stunning frescoed walls and ceilings. With the help of legendary French interior designer Jacques Grange, Francis Ford Coppola has transformed a 19th-century palazzo in his family's Italian hometown into a grand hotel with the romance and sophistication of the Belle Époque. There is something about waking up in Sofia Coppola's bedroom at the Palazzo Margherita that makes one feel rather like a princess. The walls and high ceilings are painted with golden trompe l'oeil trellising and faux marble, tall doors with long white curtains open onto a terrace and a walled garden below, and the bed is enormous. "Blending also plays a role at the Francis Ford Coppola Winery in Sonoma County, where winemaker Corey Beck uses 5 to 15 percent petite sirah in his Director's Cut zinfandel. The grapes aren't intermingled in the vineyard, but he ferments the zin and petite sirah together, like a field blend. Beck says he also achieves balance by working with his growers to encourage even ripening." Three Sonoma County wineries have electric car charging stations available at no cost for visitors to the wineries. On today's show, we hear from James Luchini of Francis Ford Coppola Winery, Jessica LaBounty of Benziger Family Winery and Dane Gaffney of Inman Family Wines, an all-solar facility with the first charging station in the county. "Francis Coppola Winery has a new star. The 2007 Archimedes is named for the Greek mathematician, whose inventions include the lever and the hydraulic screw. The wine, of course, is suitably intense and complex, dark and distinctive - much like the director's top films. Archimedes is a cabernet sauvignon with a splash of cabernet franc to finish it. The result is round and full, a harmonious Sonoma County production..."
Writer Jason Adams gave his mom a bottle of Francis Ford Coppola's most famous wine in 1995, but she died without ever opening it. Sixteen years later, he visits Coppola in Napa looking for closure, and the director tells him just what to do. Sofia Rosé was mentioned on the November 4th airing of "The Today Show," in a segment with Kathie Lee & Hoda. Actor Stephen Dorff talks about his role in the new movie Immortals, and brings along a bottle of Sofia Rosé to the hosts as a gift. "I stock up on these mini cans of bubbly (photo of Sofia Mini singles and 4-pack) and keep them over ice for guests to enjoy. They come with little straws. - I can't get over how adorable they look and how good they taste!" The legendary film director - and Sonoma winery owner - offer up three ways to jazz up your glass of vino. 2009 Francis Ford Coppola Director's Sonoma Coast Pinot Noir ($21, 13.5%): Coppola winemaker Corey Beck found a surprisingly subtle expression from divergent spots - Carneros and Russian River Valley - that highlights the versatility (and geographic muddle) of "Sonoma Coast" in an everyday bottle. You might think kids would be about as welcome at a winery as cork taint. But happily for those who didn't lose their palates when they became parents, there are wineries that welcome all in the family. Everyone we dealt with was helpful and pleasant, from our tour guide to our restaurant servers... The tasting of your wines was informative and fun. It’s nice to see that you have a gratis tasting as well as a $5 and $10 tasting for the reserve wines. I think other wineries should follow suit. Each week, as regular readers know, Terroirist poses 16 questions to a winemaker. This week, we’re featuring Corey Beck, the director of winemaking at Francis Ford Coppola Winery. Video Clip: Today hosts Kathie Lee Gifford and Hoda Kotb travel to the Food & Wine Classic in Aspen, and along the way take a break to enjoy a glass of Francis Coppola Diamond Collection Chardonnay. It's always exciting when a friend shows up to dinner with a surprisingly wonderful wine in tow. When I opened this bottle of 2009 Pinot Noir by Francis Ford Coppola, I was instantly in awe of the luscious liquid. The Winery Park is a playground for the posh (think a 3,600-square-foot swimming pool and 28 cabines - European-style changing rooms). There is also an outdoor Pool Cafe, a performance Pavilion, four regulation-sized bocce courts and more. Francis Ford Coppola has added another flavor to his iconic Geyserville winery — a swimming pool with a decidedly resort-like feel. Set on a sprawling deck that looks out over Alexander Valley, it opened Friday on a warm spring day and was an immediate hit. ABC's Good Morning America honors Francis Ford Coppola for receiving the Irving G. Thalberg Award at the 2010 Governors Awards, an invitation-only event that honors Hollywood stars. #1 | Wineries as the ultimate playgrounds: It started with a bocce court or two (Robert Mondavi Winery) and some medieval turrets (Castello di Amorosa) in Napa Valley, but the winery-as-theme-park trend hits its stride at Sonoma County’s Francis Ford Coppola Winery, which has a pool, cabanas, two full bars, and a museum’s worth of movie memorabilia. Just after Francis and Eleanor Coppola acquired the property in March 2006, he said he wanted to create a family-friendly wine resort in Sonoma County to complement the exclusive orientation of the Rubicon property he has reposition in Rutherford in Napa Valley. In what can best be described as water park meets wine tasting, Francis Ford Coppola Winery near Geyserville is hoping to be the go-to family friendly destination in the wine country. This is a whole new way of seeing wine touring: The winery as an entertainment center, a destination for family fun and, yes, a playground for parents and their children. In a way, it’s astonishing that it took this long to figure it out. What’s not astonishing is that it took a visionary Hollywood director to do so, a man who, at the core of his existence, is a “family” man in every broad and good sense of that characterization. The pizza at Rustic is perfetto. There are five kinds to choose from, including one named for Francis's daughter, Sofia — an accomplished filmmaker in her own right (she most famously directed “Lost in Translation” with Bill Murray and Scarlett Johansson). The Pizza Funghi e Salsiccia ($15 ****) sounded good and tasted even better. Francis Ford Coppola, the director of such movies as Apocalypse Now, The Cotton Club, and The Godfather, has always displayed a bold, outsize vision. Now he’s brought this same epic approach to California’s Sonoma County. Around here, Francis Ford Coppola is known more as a winemaker than an Oscar-winning director, having been a vintner for decades at the Rubicon Estate in Napa. I recently conducted the great “Killer California Chardonnay” test by tasting, sampling and drinking - over 120 wines in a short period of time. That meant Chardonnay for breakfast, lunch, dinner and dessert. Everyone has their favorite foods, from Ronald Reagan and jelly beans to Gwyneth Paltrow and anything non-dairy, non-gluten, non-meat, non-shellfish, non-condiment, non-sugar, non-alcohol, and non-caffeinated -- damn, she's a tastemaker! Bringing you Francis Ford Coppola's favorite grub, Rustic. The creative essence of Francis Ford Coppola swirls around his palatial Geyserville winery like a thick fog. Seeping into every detail, from menu to merchandising, there’s no question the Godfather director is a hands-on kind of guy, with his strong personal likes and dislikes informing into every detail of the massive remodel of the former Chateau Souverain. The newly renovated Francis Ford Coppola Winery, which opened the month of July 2010, is the latest venture from the famed film director, Francis Ford Coppola. We warned you this was coming. And now, after four years of costly and laborious reconstruction on the Chateau Souverain Winery property he purchased in 2006, Francis Ford Coppola's Geyserville winery project will exhibit its first sign of completion next week with the opening of its full-service restaurant Rustic Francis' Favorites. "2007 Francis Ford Coppola Director's Cut, Dry Creek Valley - The famed filmmaker has a smash hit with this lively, classic zin. Colored a deep ruby red and sporting a fruity nose warmed by wood and spice, the wine is bright, balanced, a bit earthy and loaded with vivid black fruit. Good finish." "The restaurant at the Francis Ford Coppola Winery in Geyserville is still under construction, but during a sneak peak at the 84-seat dining room and 86-seat outdoor terrace last week, the space appeared to live up to its new name: 'RUSTIC, Francis' Favorites.'" "I recently had the opportunity to sit down with Francis Ford Coppola winemaker, Corey Beck, to chat about all things California. Beck has a richer history with California wine than most. As the grandson of a former Chateau Montelena vineyard manager, Beck has been tending to vines since the early 1970s! In addition to giving a recap of the 2009 vintage in Northern California, he provides us with some early insight into the 2010 vintage, which emerging California appellation we should watch for, and explains why Malbec is not only for Argentina anymore."